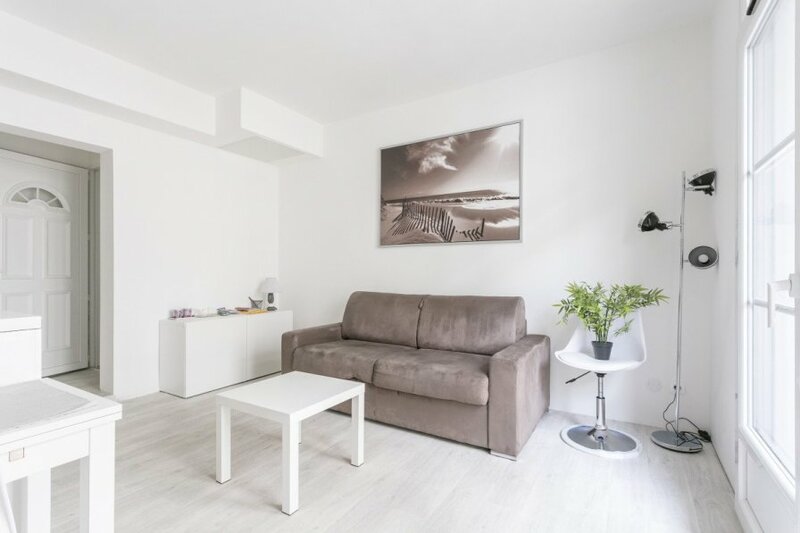 This 1 bedroom apartment is located in Saint-Denis and sleeps 3 people. It has WiFi. Do not hesitate to book this beautiful and functional apartment, close to Saint Roch station and all shops. Very well served by major axes of the city, you will be first enchanted by the neighborhood. 2 minutes from the hypercentre. Housing him, is a refurbished T2. Its subtle decoration and sober colors will make your stay a success. The apartment is on the first floor of a small building very quiet. The two windows of the living room and that of the bedroom give the rooms a beautiful light. The accommodation can accommodate up to 4 people maximum. You have access to the entire housing. Arrivals are from 14h. We will welcome you in person. In case of late arrival, try to organize in advance for the reception and delivery of keys. The exit of the place is at 11h at the latest. We live in Montpellier: this city has almost no secret for us. We are happy to answer your questions. We make every effort to ensure you a pleasant stay in Montpellier. Feel free to send us your comments. To be transparent is to enable us to improve ourselves, and therefore to offer the best possible service. The neighborhood is active during the day and rather quiet at night. Surrounded by shops, bar and restaurant, you will have no trouble finding a nice place to relax or eat a bite. At the level of the means of transport, there is almost every bus and tram that passes within two minutes walk of the apartment. If you arrive by car, you will have to look for a place by taking a small tour, otherwise there is a pay parking at the station, just next door. For buses, you will not have trouble finding the one you need at the Observatoire stop. The apartment is managed by your host whom we name Keeper. He is at your disposal throughout your stay, he takes care of the cleaning, your reception and your departure. Feel free to share your feelings about the proposed service with your Keeper in order to improve it. For any additional services, we invite you to contact your Keeper. In most cases, he will honor your request. (Reservation of taxis or restaurants, shopping, flowers, travel ...).